Style Roller Wave- 12 inchs. Great on all ages. 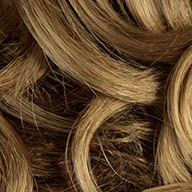 We offer a trim tutorial on length- YOUTUBE Trim. Click here to view Youtube Roller Wave attachment tutorial. Description: Large barrel type curl. Attaches with to flexible flat combs a draw string with a locking stopper. It stays put! We do offer Hair spray, Extra attachment tools and more accessories. Care Instructions: This hairpiece acts much like human hair. We suggest hair spray to hold the style as it arrives in the package before use. We have a longer style called the Summit it is 16 inches. Our color chart pictures are professionally taken; however, due to everyone's monitor being different we can not guarantee that the color you see is not slightly off. We do accept exchanges, however this is rare. Curl may vary slightly. This style is also reversible which makes it about 2-3 inches longer and layered. Click any color chart photo to enlarge. Pictures on color chart are not a representation of the style only color. Photos below represent customer designs of this product.